That's enough from me. The Friday night lights produced lots of drama at New Douglas Park, with 10-man Celtic held by Hamilton, two penalties, one missed, and a red card. Thanks for your company. We'll do it all again tomorrow on another busy Premiership Saturday. Well, well. Ronny Deila has no problem with Dedryck Boyata's red card. I wonder if any of the technical staff at Celtic will want him to review the incident again? Celtic are in action again on Wednesday, at home to Dundee, while Hamilton have a derby with Motherwell next weekend. That should be tasty, with both sides scrapping away at the wrong end of the table. "We started well but you need to take your chances. We had three alone with the goalkeeper in the second half, even with 10 men. "The sending off is an okay decision. I've seen it one more time and in that situation you have to stay on your feet and run with the player. He didn't get the ball and it's a red card. "We defended well with 10 men but we were maybe not brave enough. "There are 11 matches left and a lot to play for. We will fight to the last game." We'll here from Celtic boss Ronny Deila soon. The champions lacked cutting edge against very determined opponents when it was 11 v 11. What will he make of the sending off? "The team worked ever so hard and deserved something from the game. Michael McGovern kept us in it with the penalty save and with a bit of rub of the green we might have won it. "I'm proud of them taking something off Celtic, albeit they had 10 men." Does this mean we have a title race again? It's over to Aberdeen tomorrow. If the Dons beat St Johnstone at Pittodrie the gap at the top will be cut to four points. Okay, Celtic lost Dedryck Boyata to a dubious red card late in the first half, but Hamilton deserve credit for the way they battled back and took the game to the visitors in the second 45 minutes. That could be a crucial point in the battle to avoid the two bottom places. McGovern also made a good blocking save to deny Griffiths in a one-on-one situation, while Celtic's top-scorer went close with a great curling strike. 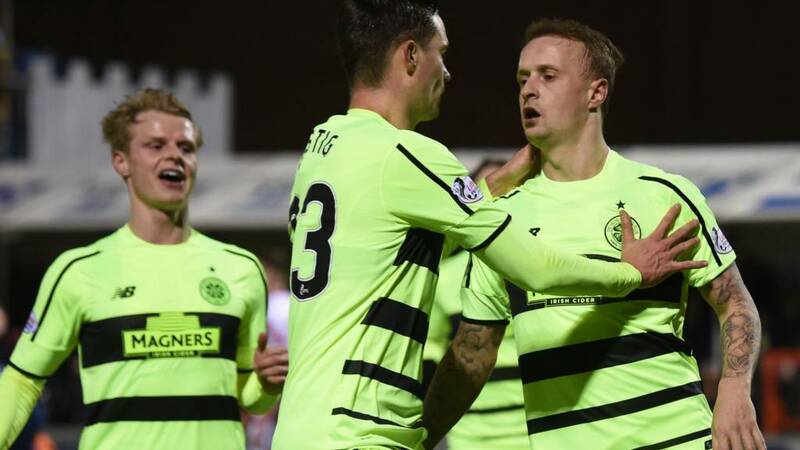 Leigh Griffiths tucked away a first-half penalty kick but could not repeat the trick in the second half. Michael McGovern made a good, flying save but it was a nice height for the keeper and not really hit with much venom. Celtic move seven points clear at the top of the Premiership, with closest challengers Aberdeen at home to St Johnstone tomorrow afternoon. Accies nudge up one place to ninth in the table and will feel that they have exorcised the demons of that recent 8-1 thrashing at Celtic Park. Oumar Diaby is on for Accies, taking over from Carlton Morris, who has put in a great shift up front. Will we get a late chance or two? It's all very tense as the clock ticks down. Colin Kazim-Richards is on to bolster the Celtic attack, replacing Scott Allan, who has had a few nice touches but not really had a chance to impose himself on the game. How do Hamilton play it now? A point against the champions would be valuable in the scrap at the bottom end of the table but all three would be a major bonus. It looks like the hosts are going for it as Ali Crawford sweeps a cutback into the path of Greg Docherty on the edge of the box but the substitute scuffs his shot and it's blocked by Celtic defender Mikael Lustig. Hamilton midfielder Darian Mackinnon flies in with his studs up and his fierce challenge on Kiernan Tierney results in a yellow card. Now it's Accies' turn to change things up as Greg Docherty takes over from Gramoz Kurtaj.